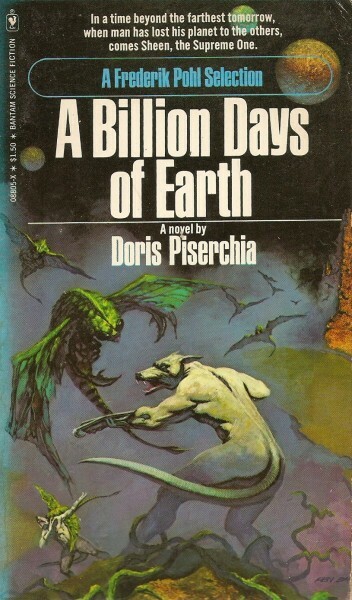 Science Fiction’s “New Wave” – the more experimental period in the late-’60s, early-’70s – is full of now-forgotten authors, such as Doris Piserchia. Piserchia’s career took a while to blossom: while her first short-story, ‘Rocket to Gehenna’, was first printed in 1966, her writing career didn’t really get started until 1973. That was when she wrote her first novel, Mister Justice; after that, her career took off. In the space of ten years she wrote thirteen novels, most of them science fiction paperback originals for DAW Books. Her works saw her associated with the US New Wave; two of her later novels were horror, under the pseudonym Curt Selby. And her exit from the genre was as spontaneous as her entrance: her last book was released in 1983, and that was all – she never wrote another SF piece again. In an America where the justice system seems to be breaking down, a time-travelling vigilante going by the name Mister Justice is striking at criminals: after photographing their crimes in the past, he arrives in the future to enact revenge. Most criminals meet the same fate as their victims, but after a plea from the President, they are found in front of police stations bound and gagged and loaded down with incriminating evidence. The authorities cannot allow this spate of vigilantism to continue, and a triumvirate of Secret Service agents take young supergenius Daniel Jordan and train him to catch Mister Justice – conscripting a superboy to take on a superman. Meanwhile, one criminal seems to escape Mister Justice’s best efforts, a kingpin named Arthur Bingle, another time-traveller who’s begun to take over the world. That sounds like a very neat plot structure, but the novel has a number of entwined subplots. Daniel’s training begins at a special school for eccentric geniuses, where he falls into a romance with Pala, an eleven-year-old Swiss orphan. (Shades of van Vogt’s supermen mixed with Heinlein’s inappropriate romances.) Pala is kidnapped during Daniel’s investigation, which throws him into despair. Later in the book, the focus is on Bingle and his cronies as they consolidate power; the government and police have collapsed into little more than licensed brigands, and Bingle’s army of “Numbers” make their move. It’s not clear whether society was already collapsing when Mister Justice began punishing criminals, or if he was part of the tipping point that caused a loss of faith in the justice system; that said, it wasn’t in that great a shape to begin with, when Mister Justice exposes the vice president as a criminal that the justice department has no interest in prosecuting. The prose style is… unique? Parts of it are very dry and pulpy, simple “He did this. He thought that.” sentences. They become a chore when ten of them are stacked together to form a paragraph. (This is very true for the first chapter and early parts of chapter two; if you bear with it, the writing does improve.) Other times, the prose has a murky, dreamlike quality to it, snippets of greater brilliance that build later in the novel. The characters speak in oblique dialogue, and while it’s easy to piece together their meaning at times, I always felt like there was more going on than the story was willing to tell me. The structure, on the other hand, is always a hot mess. Piserchia has odd preferences for structure and appears to despise paragraph breaks; at one point, between one connected sentence and another is an unannounced time jump of some six years. Some of this can be construed as New Wave experimentation, and with some patience and attention to detail most things are obvious even if they were not spelled out. But it makes the novel a challenging read when the book itself actively works against the reader. I’ve seen several people refer to Mister Justice as Piserchia’s best novel, which leaves me very apprehensive: I have five more of her books, and if this one is the best I can’t imagine how the others are. Her imagination is beyond brilliant, and the plot is full of excellent elements – the premise is great, many of its plot-threads are full of potential, and with a little work it could have been a New Wave classic of crime and punishment, or a surreal homage to the pulps. It’s a remarkable book. But Mister Justice felt like a novel condensed into a novella, leaving valuable context on the cutting room floor. It’s almost too spontaneous and subtle for a casual read, and won’t go over well with readers expecting traditional structure and coherence, but it could satiate fans looking for a stylistic New Wave SF deep cut that most will overlook. There’s enough positive reviews on the Doris Piserchia website to tell me it does have its fans. There is a tradition in science fiction of the fix-up novel, in which a writer cobbles together a novel out of several short stories, often adding linking text to create a single narrative out of the lot. Doris Piserchia’s second novel, Star Rider, is as far as I can determine not a fix-up novel. But it reads like one. The novel breaks down more or less into three sections which, while they may share the same cast and setting, appear to have entirely separate focuses. In the first, the reader is introduced to Lone – later called Jade – a young female jak, and her mount, Hinx. Jaks are humans with the ability to travel the stars using some sort of mental power. They can only do this when they are riding a mount. (The cover art may show Hinx as a horse, but the text makes clear mounts are descended from dogs. Nor does Jade appear fifteen-years-old on the cover.) Using D-2, the jaks travel about the D-3 universe, searching for the mythical planet of Doubleluck. They are as a race fiercely independent and hedonistic. Jade is neither unusual nor – initially – exceptional. Piserchia presents the jaks much like riders of the old Wild West, even down to the debased English they use. But when Big Jak comes to rescue her, and uses a device from an Earth museum to destroy the hat she is wearing, they are attacked by dreens. Jade is captured, taken to the world of Gibraltar and put in an insane asylum. Apparently, the people of Gibraltar think the jaks should be “cured”, and so send their guardians and police, the dreens, out to capture them. Jade has been separated from Hinx but, unusually, she does not go mad as a result. Eventually, she is permitted to leave the asylum and enter Gibraltar society. Although the world has no government or leadership, it does not appear to be free or anarchic. Jade is educated and learns much of the world… and the dreens, who are its secret rulers. She also discovers that the dreens are spreading a rumour among the jaks that Doubleluck has been found. Without that to search for, they are committing suicide. In the final third of the book, Jade steals a dreen mount and escapes Gibraltar. She finds Hinx and the two are reunited. They head for Earth, where Jade is convinced Doubleluck exists and is hidden. She finds it – a fantastic jewelled city inside a mountain. But the dreens have tracked her there, and with their leader Rulon – who wants to take Jade as his consort – they occupy the city. During her escape, Jade had found Hinx on the planet of the varks. These are creatures which appear to be part jet-engine, and much as mounts do they can telepathically communicate with jaks. Eventually, the dreens come a cropper, Jade admits Doubleluck does not exist, but offers the jaks something better – she knows how to leave the galaxy, something jaks have been trying to do for millennia. I’m not entirely sure a plot précis can quite get across the strange flavour of this novel. The weird swerves in emphasis during each of the three sections take some getting used to. And the opening section, with its varmintest varmints jaks and mounts reads like some bizarre pastiche of the Wild West for no good reason. In all other respects, Star Rider is very much a book of its time. Much of the story is carried in dialogue, the cast is entirely male but for Jade, and she is so exceptional she actually saves the universe. While Piserchia’s prose may be a little better than, say, Heinlein’s, and her imagination a great deal stranger, this is very much a heartland science fiction novel of the early 1970s. It’s an interesting read, but I’m not sure it would ever be called a good one. Incidentally, while the cover art on this review shows the original Bantam paperback, it was later republished by The Women’s Press in 1987. The year is three million A.D. and humans have evolved to the point where they possess immense physical and technological abilities. Humans (Homo Superior), now called Gods, in the past dabbled with genetics and created various creatures including the ferocious zizzy, which is a pouched bee/cat. The Gods refuse to interact with the denizens of the Earth and occupy themselves by engaging in various leisure activities in the clouds. However the Gods are not the only sentient creature inhabiting this future earth. Rats have evolved and gained sentience without the assistance of the Gods. The rats call themselves humans. These rat/humans have constructed an immense foundry to supply surrogate metal hands… Occasionally pockets of intelligent rats without metal hands are discovered. The action takes place in Osfar (the location of the hand foundry) a city in the middle of a desert cut off from its water supply by an earthquake. The main characters are Rik, a brilliant and fearless scientist, and his adopted brother Jak (whom Rik discovered and supplied with hands). The humans are ruled by an inbred “caste” called Fillys who are virtual dictators and control vast amounts of money and live in huge estates. The inhabitants of this future earth, besides the Gods, are engaged in vicious interspecies strife (the zizzies attack the human/rats and vice-versa). A parallel story emerges as well — Rik spends his time stealing gadgets from the Gods (humans). On one of these treks Rik and Jak encounter a helpless Goddess who momentarily lost her abilities while secretly giving birthabout to be consumed by a moving hill. Yes, a moving semi-sentient hill! The two narratives — Sheen’s slow engulfing of all human life and Rik’s interactions with the aloof Gods – intertwine in spectacular fashion. A Billion Days of Earth is a heady brew of fascinating ideas — semi-sentient moving hills, evolved human/gods uninterested in the world below, sentient rats with metal hands, and of course the amorphous/shape-shifting ego consuming Sheen. The snappy dialogue between Rik and Sheen is a delight to read (and the dialogue between Sheen and any of the creatures it attempts to consume). Highly recommended for all sf fans. The review originally appeared on Science Fiction and Other suspect Ruminations. Welcome to the fevered fungal/vegetable nightmares and uncanny vistas of Doris Piserchia. A virtually forgotten science fiction author — her books are all long out of print — who deserves to be read and remembered. 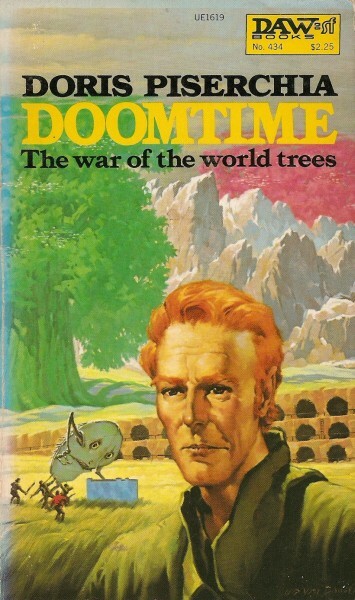 Doomtime is by no means a classic (and not her best work) but should be read for its sheer imaginative and haunting power. Despite the fact that the pacing is poor, the characters undeveloped, and Piserchia’s prose often falters, the world she creates is memorable and disturbing (sadly, the volume is “graced” with some atrocious cover art, well, besides that weird bug thing — a Piserchia stable). The book opens with Creed surviving an assassination attempt — however, with the assassin (now missing a section of his brain) attached to Creed’s head. How did this happen? Well, Creed’s people produce most of their food from a gigantic brass bowl (a technology developed in the distant past) filled with proto-flesh (which gurgles out into various molds creating chickens, etc). The assassin attempted to push Creed into the pool (which Creed cleans for a living) but bubbles of the proto-flesh melds the two together. Perhaps this gives you an idea of Piserchia’s imagination? Creed eventually discovers a series of bizarre occurrences, strange molds near the brass bowl produce pinkish creatures which spin like tornadoes and kill people, people disappear into trees only to reappear, and others hunt him with bows and arrows. He realizes that one can meld with the trees which are suddenly growing prolifically near the city. The green ones are called Tendron and the reddish ones Krake. These trees — linked to each other by roots and eventually to gigantic Everest sized trees of each color — are fighting a war between each other. By dipping (melding) into a tree, humans becomes addicted and subtle commands implanted into their minds — the humans become pawns in their war. Creed sets off to rectify the situation and meets fungus creatures which meld with humans, strange fungus pools which unravel peoples’ psyches, humans sucked dry by Tendron and Krake, humans mutated beyond recognition by the trees, humans turning into trees, fuzzy smallish fungus which grow around peoples’ necks, addicted humans stuck in hibernating trees desperate to meld…. Eventually Creed comes upon the central Tendron and Krake — separated from each other by a mountain range — and an unusual secret in their upper limbs. The most disturbing element of this novel is how little the humans have control over their situation. Entire groups of humans are transformed by these trees — humans are in no way the superior lifeforms. Piserchia is the master at showing instead of telling — often in an offhand matter of fact way which intensifies the dread and unease. This has to be one of the more unusual and disturbing worlds I’ve ever read about. Sadly, Doomtime‘s structure is a let-down. The entire middle section drags as characters endlessly explore in groups, get separated, manipulated by the trees, betray their companions, feel sorry for them, escape, get separated, get tree manipulated some more, and go out and explore as if nothing happened. Piserchia clearly did not know how to finish the novel (or perhaps reach her page limit). Also, Piserchia writes using clustered vignettes. Thus, an individual narrative thread rarely goes beyond a page or two. This style is really frustrating. That said, the world itself with its bizarre technology, creepy female fungus creatures, twirling pink creatures, proto-flesh weapons, tree dipping, fungus melding activities, human transforming, and of course the weather creating world destroying trees, is staggeringly inventive.